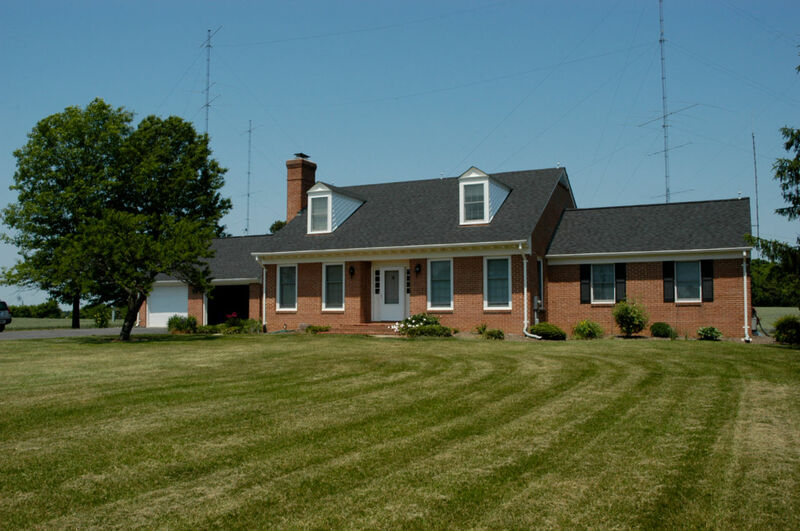 The house is a brick-faced Cape, built circa 1988, and located one hour from Washington DC in Poolesville MD on 46 acres. On the ground floor are the living room, family room, dining room, kitchen, ½ bath, and the master bedroom (with adjoining full bathroom), currently servimg as the “shack”. Upstairs are two bedrooms and a full bathroom. A two-car garage is connected via breezeway. The unfinished basement contains a large storage area and a workshop. The HF station can be operated as single-op, multi-single, or multi-two. It employs four 190 ft., rotating towers guyed with Phillystran at four levels to 10 ft. I-beams buried in 4 feet of concrete. The towers carry stacks for 10-meters (8/8, and 8/8/8), for 15 m. (7/7, and 7/7/7), for 20 m. (6/6, 5/5/5. and 6/6/6) and 40 m. (full-size 4 over 4). Additional antennas include two linearly–loaded, 4-element 40 m. beams, and a high 7-element 10 m. beam. For 80 m. there are 3-element, wire-loop Yagis (at 140 feet) covering 60⁰ (Europe) and 300⁰, plus a rotatable “Lazy-H”. For 160 m. there is a 3-element wire Yagi (at 190 feet) pointed at Europe and a 3-elment K3LR array (covering 60⁰, 180⁰ and 300⁰). There are wide-band, inverted-Vs for 40- and 80-meter NVIS propagation, as well as a receive-only Hi-Z 4-square, and 500 ft. Beverage at 60⁰. The VHF station is located in the workshop area of the basement. The antennas sit on a 60-foot tower adjacent to the house and cover 50, 144, 220, 432, and 1296 MHz. The equipment in the HF shack includes four Yaesu FTdx500 receivers with extensive filtering for mutual interference protection, four Alpha amplifiers, Palstar tuners, switchgear etc., along with extensive documentation. The VHF station employs a K3 for 6-meters and Yaesu FT736R for the four higher bands with legal-limit Lunar Link amplifiers for the four lower bands. Contact the owner of this property, John Evans, N3HBX, by using the Inquiry Form on this page.